Within the globalised context of the new century relations between Europe and Africa need to evolve radically. Links between the two neighbouring continents that were defined for a long time as a juxtaposition of bilateral relations mainly based on a colonial past are now progressing towards a more balanced partnership founded on the awareness of a common future that will be built more on joint issues and risks rather than on a moment they shared together in History. Indeed the African continent which starts just fifteen kilometres from European territory is the focus of all the “major dangers” facing the modern world: uncontrolled migration, new epidemics, climatic and environmental catastrophes and the threat of terrorism. But it is also where there is the most potential whether we are talking of natural resources or of future consumer demand and investment. Of course the European Union is still Africa's leading economic partner and also its primary donor. But this historical monopoly is now being breached by in-roads made by “emerging sponsors” such as China and Indian, the large countries of Latin America and the monarchies of the Gulf, even Iran as well as the USA – which is anxious to protect its energy supplies, counter terrorist threats, widen the battleground for Christian values and democracy and to fight against Chinese “entryism” which worries them. The “Joint Strategy” put forward at the EU – Africa Summit of Lisbon seven years after the first summit in Cairo aims to build on a really new relationship, to establish a balanced partnership between the two continents based on a logic of mutual interest and shared objectives, rather than on compassion or fidelity. It still has to be applied however and on either side some partners might be forced to face up to their contradictions. 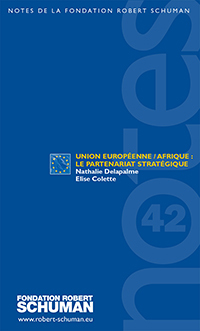 It is clear that from now on the security of the European continent as well as its ability to maintain continuous sustainable growth will depend, soon and quite closely, on the development and stabilisation of the African continent. Tax inspector, a top ranking civil servant and advisor for Africa, Nepad, Francophonie and Humanitarian Aid at the French Foreign Office (2002-2007). Journalist, specialised in international relations and Africa. She has worked for the weekly Jeune Afrique since 2002.